COLD IN HAND is a very sad book, written by an author at the peak of his powers. Understated yet powerful, it is superb - this is going to be one of the very best novels I read this year. John Harvey wrote ten spare and excellent books about Charlie Resnick, a moderately successful detective inspector with the Nottingham police. He then wrote a trilogy about Frank Elder, one of Resnick's colleagues who had taken early retirement and moved to south-west England. Resnick began to feature in the Elder books, however, and one felt that the author could not easily shake off this introspective, jazz-loving, Polish man. COLD IN HAND is the evidence that Resnick hasn't taken being written-out lying down, and readers are the winners. At the end of the previous series, Resnick and his colleague Lynn Kellogg, a bright detective recently promoted to inspector, had fallen in love and moved in together. As COLD IN HAND opens, Lynn is on her way home for a Valentine's day celebration with Charlie when she stops to help at a disturbance. Two girls are threatening each other with knives, encouraged by a gang of fellow-teenagers: before police back-up arrives, Lynn successfully deals with the immediate threat, until someone in the crowd fires a gun - Lynn is injured and one of the girls is killed. Resnick, whose career has not been stellar and who is nearing retirement, is called in from his backroom duties to help with the ensuing investigation. Tact isn't his strong point, however, and he reacts understandably but badly to the threats of the victim's father, who unfairly blames Lynn for his daughter's death. The investigation continues against a background of endemic urban crime, drug dealing, social breakdown and family betrayals. The police are running out of leads, and the media are not shy to add their particular brand of criticism and hyperbole to the incendiary mix. Meanwhile, Lynn is recovering from her injuries and fending off the unwelcome attentions of the smooth and somewhat suspicious Stuart Daines of the Serious and Organised Crime Agency, whom she had met at a conference and is now in the area, working a case. Daines is a metaphor for modern policing and attitudes - the antithesis of Resnick's blunt and proudly traditional, if slightly defeated, style. Lynn is the main investigating officer in a crime that took place some months before COLD IN HAND opens, in which a young Romanian woman who worked in a sauna and massage parlour was killed, the police believe by a Serbian criminal. Lynn has lined up two witnesses, but before the case can come to trial, one witness disappears and the other, Andreea, another Romanian who worked at the parlour, is scared for her life and wants to escape. Lynn helps Andreea to hide in London in the run-up to the trial, but becomes increasingly suspicious of Daines and his puzzling interest in the case. Then an awful tragedy strikes. 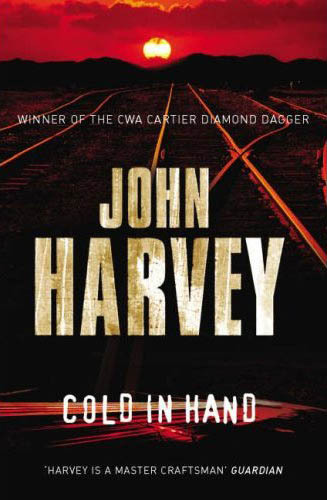 The strengths of COLD IN HAND are many: the plot is sure; the police procedural aspects are convincing - with apparent lack of effort, the author conveys the down-to-earth minutiae and political realities of modern crime investigations, as the police struggle to make progress against a background of widespread mistrust from the local community as well as all the petty restrictions and laws that impede them, as they see it. The characterisations are strong: the author's sympathy for the plight of Andreea and the choices she has been forced to make; the interactions between the police (some supportive, some abrasive); but particularly the relationship between Lynn and Resnick is told with melancholic insight that reveals much about the depth of emotion without unnecessary words. This is a very sad book, but at the end of it there are some hints that the future is not all bleak.